We are back with Operation Santa this year and it was even bigger this time around! Last year, we played Santa to 15 underprivileged children in Los Angeles, and this year we went up to 20! BeAnElf.org is an organization that takes in letters to Santa written by children requesting a gift that they likely wouldn't otherwise receive during the Holiday season. Once again, we had a blast reading through the piles of adorable letters and left feeling nothing short of moved by so many selfless children, and excited to be able to give them the special you they want. So many of the children selflessly requested gifts for their parents and siblings, or heartbreakingly simply asked for school supplies or warm clothing because they "feel cold when they leave for school". This year, the letter that stood out to me was from an 8 year boy. He wrote to Santa, admitting he was not on his best behavior and was not "acting like a good person". He was ashamed he treated his mother poorly at times, stole a couple pencils and was not trying his best in school, but went on about how he really wanted to be "a better person" and was going to try harder to make good decisions to be a better student. Thank you to everyone, as usual, for supporting Disco Panda, and in turn helping out the world in a bigger way. More than half a million children in California don't have a home. 25% of these children are not in school, and many under-privledged children who are, go to school without a backpack on their backs or even a pencil to write with. Without an education and the proper tools to succeed in the classroom, the future of our most disadvantaged children is precarious. 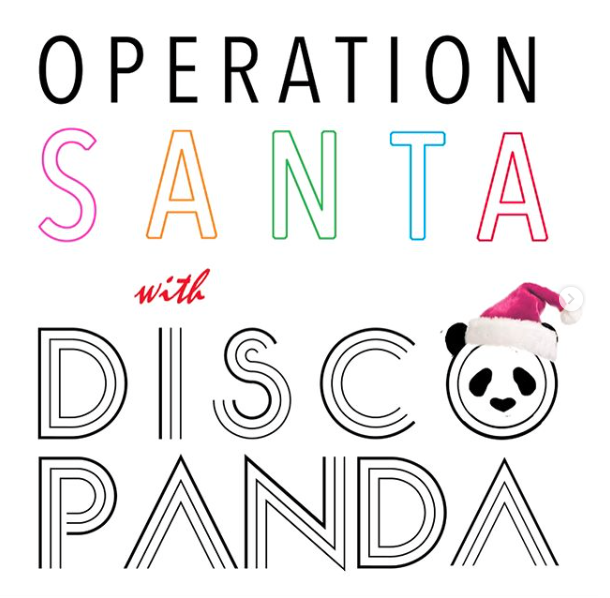 DISCO PANDA has launched OPERATION BACKPACK as a means to committing to helping ensure that every child has the supplies they need to succeed and thrive this school year! We have purchasedbackpacks, but we need your help filling with them with school supplies! Our Operation Backpack Amazon Wishlist (link in bio) is packed with supplies ranging from binders, notebooks, paper, pencils, glue, scissors, calculators, erasers, and more, which we will use to stuff backpacks sorted by age group. Ash will be hand delivering all backpacks to children in need through an organization close to her heart called School On Wheels. FASHION MAMAS® is an exclusive, members-only network for influential mothers who work in fashion and creative industries. The organization's members are some of the most inspiring, talented and all around incredible women in the city. I have had the pleasure of meeting quite a few, all of which exceed their reputation. I just love them...and this organization as a whole. This month, we are teaming up with FASHION MAMAS® to collaborate on a special t-shirt that will benefit a A PLACE CALLED HOME- a great organization that uses music to enrich the lives of children from South Central L.A. Who better than music icon, David Bowie, to be the face of the tee that will help use music as education and healing to children living in a more challenging neighborhood? 20% of each sale of our BOWIE T-SHIRT will go directly to A Place Called Home!! 15% of proceeds from each and every sale from MAR-MAY 2017 will benefit PLANNED PARENTHOOD! Because we want to protect safe, reliable, and affordable access to healthcare for 2.5 million women and girls, and help preserve the reproductive rights of women and girls for generations to come. Just one of the many bags of gifts for some very special children! Thanks to BeAnElf.org, we were able to play Santa to 20 underprivileged children who wrote letters to the big man up at the North Pole, requesting a gift or two that they wouldn't otherwise receive during the Holiday season. We read so many beautiful and heartbreaking letters- 7 year old Kailee wrote that all she wanted for Christmas was new winter shoes for her baby brother. Camille wrote that she just wanted Santa to bring something for her mother, who was always sad because she couldn't pay the bills. Buster had to give up his dog, and just wanted a stuffed puppy to remind him of her. These special children are so brave, resilient and selfless, and we were so grateful to all the Elves who supported Disco Panda and made giving them the special Holiday they deserve possible.